Kali’s favorite thing to do is travel. Eric’s favorite thing to do is save money. This is how we manage to do a lot of both. It seems like there’s one thing every single 20-, 30-, and 40-something has in common these days: we all want to TRAVEL. We want to see the world, experience new things, try new foods, and of course, have some really great photos to share on the ‘Gram. But all that travel and experience can seriously add up to a nasty blow to your budget. So how do you balance the need to save with the desire to explore? It’s all about priorities… and maybe using a tip or two of ours along the way. Saving money is important. So is having a system, managing your cash flow, not giving into lifestyle inflation… but if you can’t increase your income you are always going to struggle toward your goals no matter what they are (travel or otherwise). Focusing on increasing income is harder in the short-term but much more efficient in the long-term. Spend the time now to make the plan and take action to grow your earnings, rather than constantly looking for quick and immediate ways to spend less in the moment. Don’t try to keep up with the Joneses who look flashy, but in reality, their finances are a mess. (That probably happens more than you think!) Don’t get caught in a comparison trap. Unless you see a budget or a balance sheet or a net worth number, you have no idea what’s really going on behind someone’s financial scenes. Life is about choices. There are a ton of things you could be doing, but some that you are going to value more than others. Know your own priorities and align your money with those priorities. JetBlue is our absolute favorite airline. Sign up for their emails so you get notified of their sales; you can get fares as low as $39-$49 one way. You’ll be happy to know we confirmed the Cohen brothers movie, Fargo, was not really based on a true story (although it might have taken some inspiration from other, real-life crimes). 0:21: One of Kali’s favorite things to do (and is always happy to spend money on)? Travel. 0:49: It’s February in 2019, and already, we have almost a trip a month planned for the year. 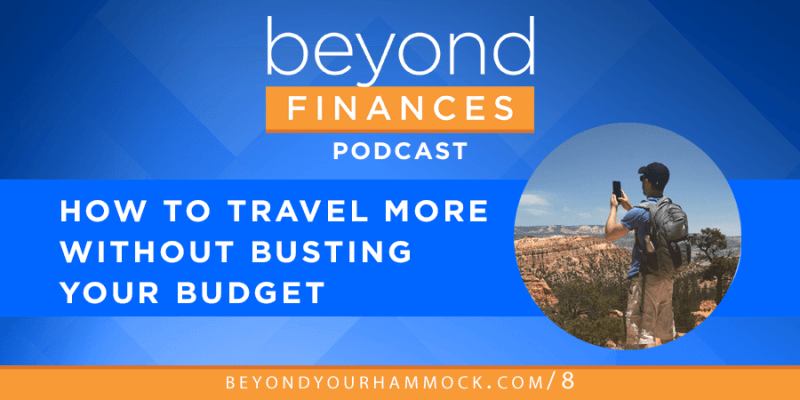 It’s a little crazy, but exciting — and it gave us the idea to share how we make so much travel financially feasible (and how we travel without busting our budget), because we know we’re not the only people who love to travel. 1:02: Eric points out that this is a priorities conversation. These are the things we like to do, so we need to plan around them. 1:14: If travel is one of your top priorities, then build it into your financial plan. Make it a part of your normal budget. Account for it. 1:32: That’s the number-one thing we do — we specifically save for travel. It’s a line item in our budget. There’s a plan for it. 1:43: Saving money is more important than saving money. Eric would not be happy if he was constantly traveling to the point where he couldn’t save. Again, priorities. 2:32: We’ve been saving for travel and big trips for years. It’s a line item in the budget. Every month, we transfer money from checking to savings and earmark it for future trips (even if we don’t have something specific planned). 2:49: We know we’re going to travel. So why would we not plan for those trips in our regular budget? What we try to do for planning purposes is say, “we can expect to travel X times this year and from our experience/research we know it’s going to cost Y dollars.” Then we can take that Y dollar amount and divide it by 12 — that gives us a specific amount to save each month to fund our travel for the year. 3:26: We have a logistics system in place, and that’s a big part of how we make travel financially feasible. There’s a system that aligns with our priorities. 3:55: We cut back in other areas so we have more money available for travel. We’re not minimalists, but we don’t buy a lot of stuff. 4:40: We don’t mind cutting out stuff that doesn’t mean as much to us as travel does when it comes to discretionary spending — and then when it comes to fixed expenses, we’re also mindful of how much money goes to things like rent. (Some people say you can spend ~30% of your income on housing… but we spend around 12-15% on housing.) We live in a nice apartment for sure — but it’s not the highest-end place we could have possibly been able to afford, either. We don’t max out our budget on any one category, so that, again, the money is available to spend on things that matter more. Namely, travel. We know our priorities. Travel is a priority, so we spend more freely on this while being more strict/frugal in other areas of spending (like material goods, clothes, tech, etc). We don’t max out our budget on fixed expenses. Just because we could afford a higher level of rent doesn’t mean we’re going to hit the ceiling on that… because it means less money available to spend on what we like to do. We plan and save for travel. We have a systematic way of managing our money so that cash gets earmarked for travel, and it’s available when we want to take a trip. 7:18: In addition to saving money, the other big-picture item is that we really focus on increasing our income. There are only so many expenses you can cut back on; if you want to save at a high rate but also enjoy things like travel, you can’t just pinch pennies. It’s not going to be enough. 7:41: We don’t spend a lot of time bargain-hunting; we don’t cheap out on travel because it’s important to us. So we don’t spend time/energy scrimping and saving to extremes. We instead use that time and energy to earn more. 8:04: It’s a misconception that, if you want to save you HAVE to cut expenses. That’s why people don’t want to have the “save more money” conversation! Everyone assumes it means you have to cut back or deprive yourself. In some cases, you do need to cut back (if you’re overspending). But if you could increase your income, that gives you a lot more room to spend and save. 8:33: In our case, we’d much rather spend our time figuring out how to increase our household income than spend our time figuring out the best savings hacks and tricks and crazy frugal/cheap strategies to spend less. You have to do that (the hacking) over and over and over again to make it work. But you can figure out how to grow your income, that’s a consistent way to get more money coming in that you can use to save or spend. 9:00: Focusing on increasing income is harder in the short-term but much more efficient in the long-term. Spend the time now to make the plan and take action to grow your earnings, rather than constantly looking for quick and immediate ways to spend less in the moment. 9:34: “Travel hacking” is often a burnout job; it just takes too much time and energy. If you funneled all that effort into making more instead of only trying to avoid spending, you’d likely end up financially ahead in the long run. 10:29: Saving money is important. So is having a system, managing your cash flow, not giving into lifestyle inflation… but if you can’t increase your income you are always going to struggle toward your goals no matter what they are (travel or otherwise). 10:59: We recently had a little Twitter convo, sparked by Kevin (@ferventfinance on Twitter and host of Reversion to the Mean podcast) about this issue. The personal finance space conundrum: 95% of discussions, books, and articles on the topic concentrate on budgetting, investing, debt repayment. Yet, the one thing that will probably move the needle the most is increasing income. 11:59: Any discussion of financial success is one of privilege. Making the choice to save is a privilege. Making the choice to be frugal is a privilege. Having choice in general is a privilege! 12:14: We know not EVERYONE will be able to increase their income — and in suggesting the answer may be to increase income, we’re NOT suggesting you just walk out your front door and shout to the universe that you want more money and then wait. 12:33: It takes constant work and action and creativity to increase your income. It is not easy. It takes a combination of mindfulness and effort and work AND luck and chance… and not everyone gets the same luck and chance. 13:26: There are a lot of options for increasing income — but they all take work. Don’t expect anything to fall into your lap. If you just dream about it and say it’s not possible, though, you’ll continue dreaming about it and it’s not going to be possible. Don’t assume it’s impossible or assume your income is something that’s out of your control. 14:24: Now, on to the “small-picture” stuff we do to make travel fit in our budget. These are the little things that help us save a bit (but keep in mind these are not as important as the big-picture things!). For example, we do use credit card points. They’re great if you can spend responsibly and use credit wisely. 15:03: We don’t do much credit card churning to get sign up bonuses, but we do intentionally use credit cards (we hardly ever use cash or debit), because we know we’ll get 1-2% more for every dollar we spend thanks to points or cash back. And let us reiterate that: ONE TO TWO PERCENT. It’s a tiny little thing that’s helpful because it’s there but not something that’s going to seriously move the needle. 16:20: Kali loves Scott’s Cheap Flights for actual deals. It’s free to sign up for their emails (they have a premium service but we just use the free one, and that’s how we snagged cheaper airfare to Greece). 16:57: Just be aware that the cheapest flights might come with some caveats — crazy layovers, often-delayed flights, crummy airlines, no seat selection, etc. We tend to aim for the low end of mid-priced so we can choose our seats and not get stuck on insane flight schedules. We usually only travel with backpacks (no luggage fees, easier to get on public transportation instead of having to use a taxi). The longest trip we’ve done with just backpacks that fit under the airline seat is 7 days. Again, we fly JetBlue which provides free WiFi on the plane.. which means saving $100 (two $25 internet passes one way, so that’s four passes total for the whole trip) on that alone. We avoid overpriced food (we never eat at the airport; we don’t do room service; we refuse to pay for a $20 burger at a hotel). Another shoutout: Gutsey Bars. The Boston variety is our favorite because of the protein; it acts a meal replacement if needed. We never travel without them at this point. 23:40: Finally, there’s a bit of a caveat that we think is really important to discuss for the sake of transparency. A lot of the travel we do is for professional reasons. We both speak at conferences throughout the year, which means that our travel expenses are covered for those particular trips. And 90% of the time, we’re also getting paid to speak. 23:59: It’s an opportunity we get to take advantage of, and that’s awesome when it works out well (like when it’s to a destination we’re excited to check out, when we can both go together, and when we have enough time to take a personal day or two). Of course, it’s not always a good thing. It means going places we would NOT normally choose to go, at least not for a vacation (hello, Fargo, ND) and we don’t always get to travel together which can be more tiresome and lonely. And, of course, we’re traveling for work which means… we work. 25:36: Also, we looked into it and confirmed the Cohen brothers movie, Fargo, was not really based on a true story (although it took some inspiration from other, real-life crimes). You’re welcome. 26:27: It’s really cool we get this opportunity to travel for work — but this isn’t a tip or a piece of advice. We’re not saying “go get a job where you can travel for free or cheap.” We mostly wanted to share this note for the sake of transparency, especially in a world of social media where it’s SO easy to look at someone else’s Instagram and think, “man, how are they doing all this cool stuff and what am I doing wrong because I’m not? How can they afford it and I can’t?” Well, they may be like we are and have something about their work that makes their lifestyle a little more feasible… or maybe they can’t afford it at all. Maybe they’re overspending or in a ton of debt (with nothing to show for it but some pretty pictures on the ‘Gram). 27:09: Keep your eyes out for your own opportunities. And take everything with a grain of salt… especially if you see something on social media or hear something anecdotally. Don’t try to keep up with the Joneses who look flashy and seem to have a great time… but in reality, their finances are a mess. That probably happens more than you think. Don’t get caught in a comparison trap. Unless you see a budget or a balance sheet or a net worth number, you have NO IDEA what’s really going on behind the financial scenes. 28:54: Understand that life is about choices. And you need to rank those things in order of priority. There are a ton of things you could be doing, but some that you are going to value more than others. Know your own priorities and align your money with those priorities. Because life is about choice and you can make your own choices… plan to figure out what the best combination of choices is for you.